Every time I go through US immigration, I want to slam my fist on the desk and bellow “What makes you think I want to visit your rotten country anyway?” Trouble is, I really want to visit my friends and grab just a fragment of all the fun available in this vast, beautiful country. 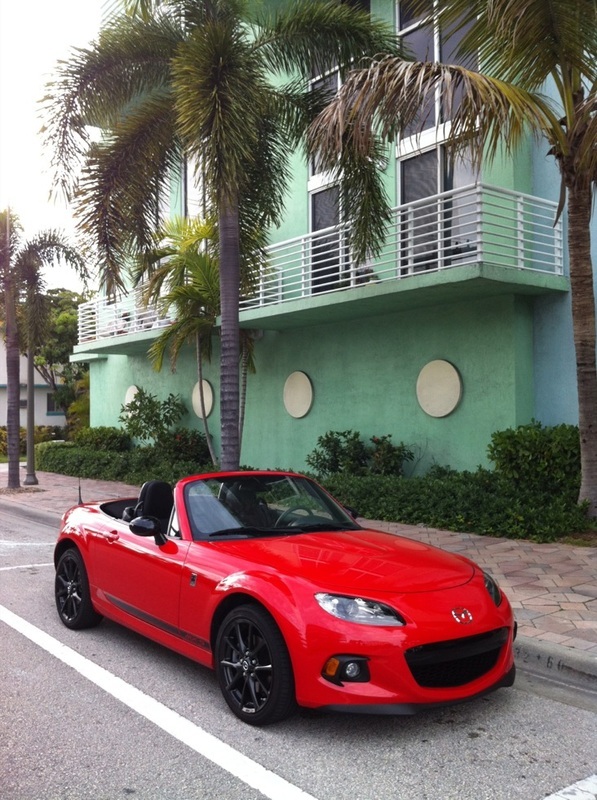 And this time, I had a 2013 MX-5 Club waiting for me. I love the MX-5. I love its chubby little body and happy ‘face’. I’m delighted that, despite three generations and a number of facelifts, it remains true to its mission: delivering the fun enjoyed by people wearing tweed caps and headscarves in 1960s' sports cars. Its 2.0-litre engine gives it just enough power to be nippy (and keeps its insurance costs low), but it’s not about speed. It’s about the way it darts round corners, and the way you slip into the snug bucket seat to become one with the machine (like a rider with a well-trained horse, as imagined by its original chief engineer). My MX-5 Club was waiting in the parking lot while we waited for two hours in the immigration queue. Signs pointed out that cuts to funding had robbed the immigration service of staff. Those left were clearly not having a nice day. We collected the car some time after midnight our time, frazzled, not looking forward to the airport’s freeway spaghetti and an hour’s drive to Lake Worth. It took about 10 minutes for the MX-5 and Dusty Springfield’s sultry voice to soothe my fevered brow. The Club announces its sporting character with a megaphone. Our car’s paint was perfectly named True Red and other red cars in the lot looked more True Blood undead in comparison. Its alloy wheels were as spikey as a punk’s Mohican, and that blacked out grille resembled a fiendish, mocking grin. In my befuddled state, I was sure I caught a glimpse of devil horns and a tail. This edition doesn’t have any more power under the hood than a standard car. It does have sports-tuned suspension, Bilstein shocks and a shock tower brace for added stiffness, a mechanical limited-slip diff and big 17-inch alloy wheels with grippy high-performance tyres. Inside, painted red metal with black decals and cloth seats reinforce the idea that this is a no-frills fun machine. Just one thing worried us. 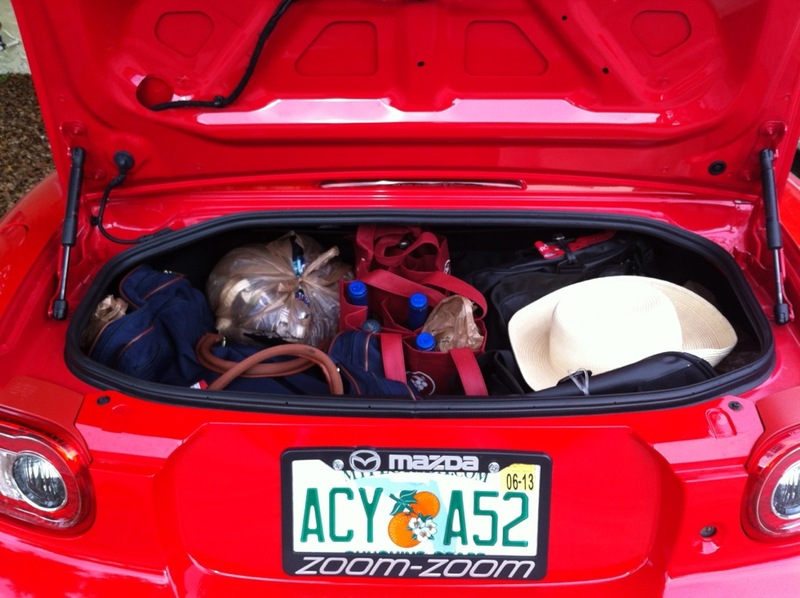 Would we get our bags in the trunk/boot? That was a practical detail Richard had pointed out after I’d gleefully announced what we would be driving for the first week of our trip. We'd packed extremely light for two weeks using squashy sports bags, and we’d been prepared to take some clothes out to stuff into crevices. We thought one of us might even have to hold a bag on their lap. In fact the luggage fitted with minimal squish, and there was enough space for my cabin bag plus duty-free. The roof stayed up for the dark journey. There was no sat-nav, of course, but we were able to plug in the iPhone to provide our own mix of music rather than the local radio’s country, country, country and western. The audio system had to compete with plenty of roar from the tyres on concrete roads and wind whoosh, but we were able to argue over the map at normal volume. For most of the rest of the week, the roof went back whenever we set off. Richard could shove it back with one arm from the driver’s seat. I had to get out to do it, and we both had to get out to raise it again without rupturing something. Once it was down, a mesh board between the seats kept buffeting to a minimum. Sadly the roads were far from challenging: the only curves near Palm Beach had a speed limit of 25mph. No matter, it was glorious doodling along past smart homes on one side, the turquoise Atlantic on the other. Even at lower speeds, the quick, direct steering, short, slick gearchange and balanced handling kept me entertained. If I was Goldilocks, this was Little Bear’s car. Everything felt just right. The lucky lads at Motor Trend got to try the Club around some mountain bends. It’s interesting that they chose, not for the first time, to compare it to the front-wheel-drive Scion FR-S coupe (twin to the Subaru BRZ). Predictably, they found that the Scion – a car designed for the import tuner generation – can be drifted around bends while the Mazda ‘just sticks’. 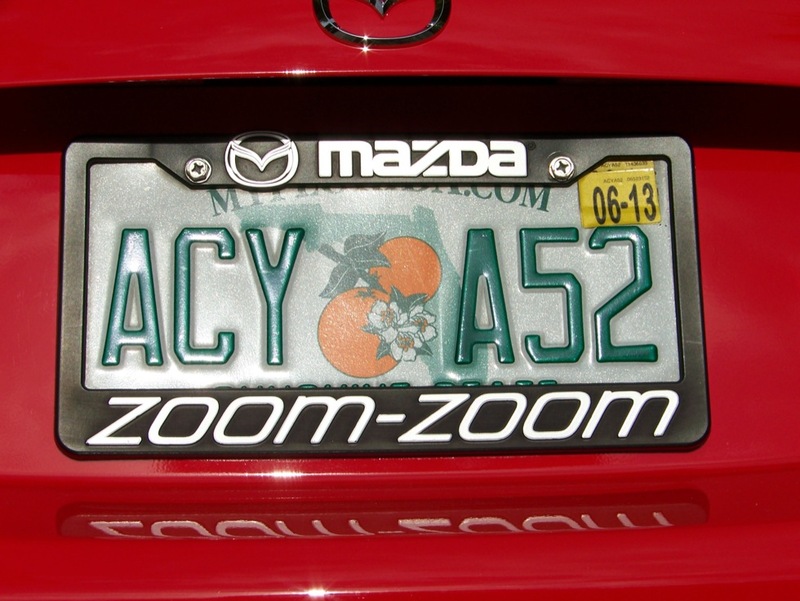 They conclude younger folks will probably prefer the Scion, while the Mazda will be appreciated by more mature drivers. 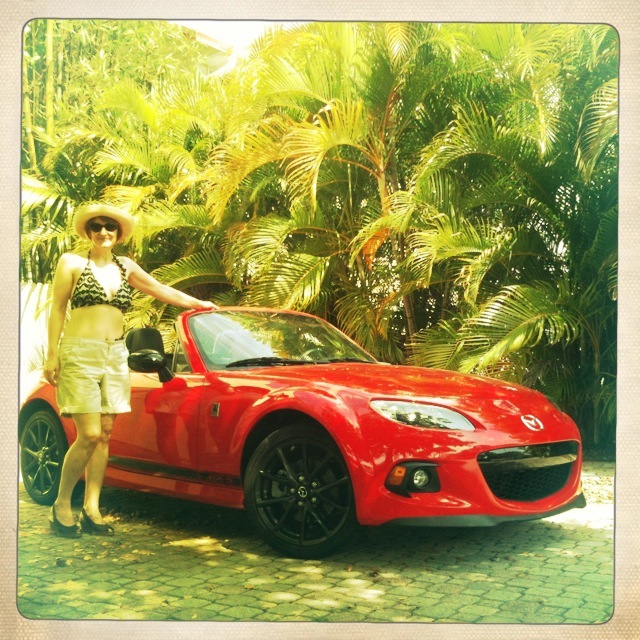 I’d concur, plus I reckon more women would prefer the Mazda because of its cute looks and convertible top. I’ve never driven an FR-S, but its styling doesn’t do anything for me. The Club got plenty of looks, too, not just from the mature passers-by, but also from the hipsters driving huge 1970s’ Yanks with Landau tops and porthole windows. Our biggest trip was to Walt Disney World (with no kids - best way! Click here to see why). As we arrived at the fabulous African-styled Kidani Village in Animal Kingdom, other guests and greeters piled on the smiles and comments. We had a ball (the Aerosmith Rocknrollercoaster is a blast). The only sad thing was not needing a car for two days. Giving the MX-5 back at the end of the week was hard. 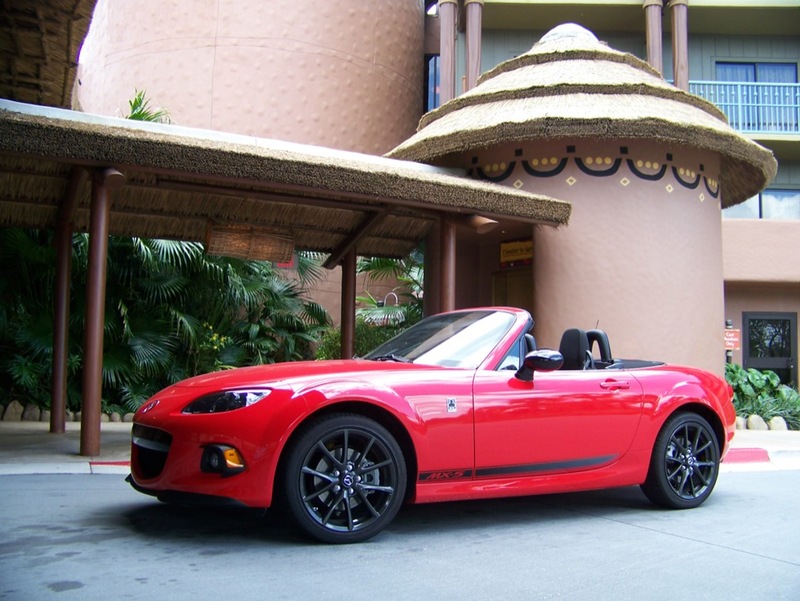 It’s the perfect vacation car. The low sports seats are supportive and comfortable for long journeys, it’s easy to park, and driving with roof up or down is a joy. The Mini Cooper S Paceman had a hard act to follow. I’ll be writing about that next.